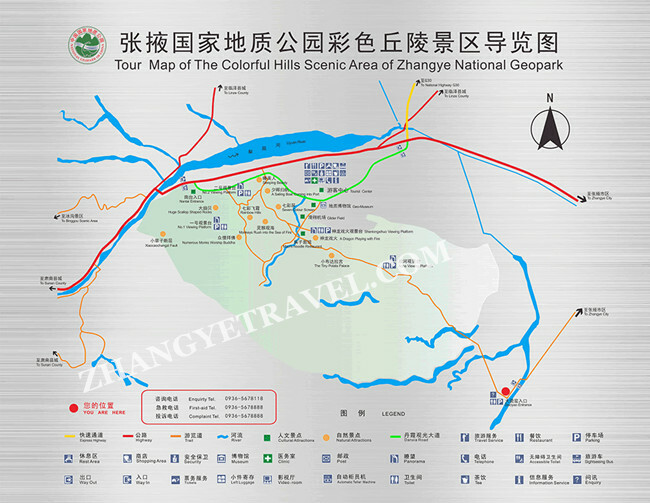 How to get to Zhangye Danxia Geopark? QUESTION 1: WHERE IS ZHANGYE DANXIA LANDFORM? 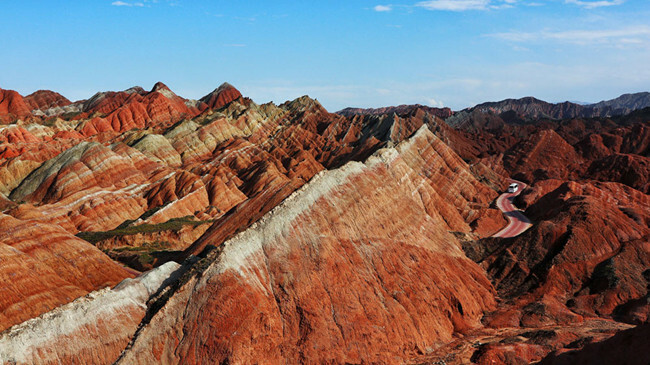 Zhangye Danxia Geopark Scenic Spot is 40 kilometers from downtown Zhangye, about 30 minutes’ drive. You can go to Zhangye city by air or train first, and then rent a car or take a bus to the north entrance of the scenic spot. QUESTION 2: HOW TO GET TO ZHANGYE CITY? 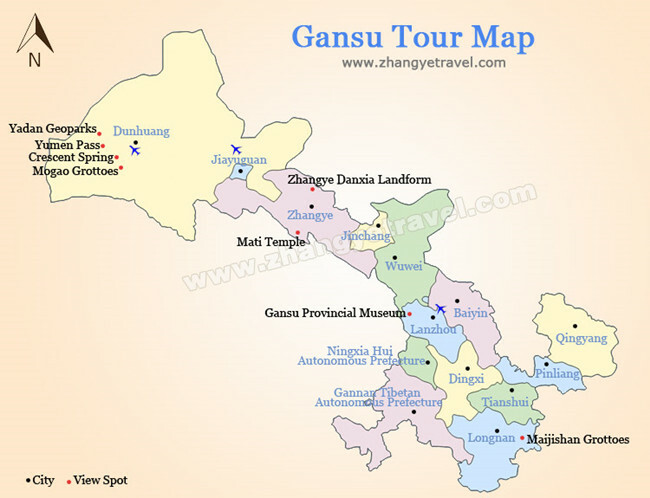 By Flight: Zhangye Ganzhou Airport is located in southeast of Zhangye city, 24 kilometers from the city center. For now (19th September, 2017), all flights to Zhangye will stop or transfer in Lanzhou. Regular flights include Xi’an to Zhangye and Lanzhou to Zhangye. If you feel it inconvenient, you can fly directly to Lanzhou or Xining and then transfer to railway. 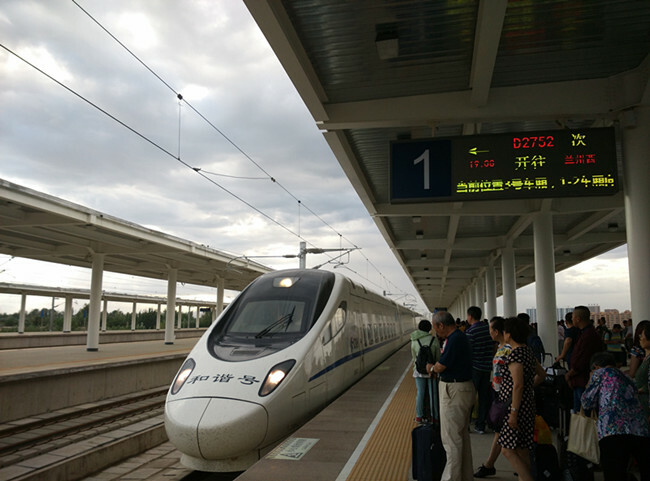 The high-speed railway only takes 3 hours from Lanzhou to Zhangye and less than 2 hours from Xining to Zhangye. By Train: There're two railway stations in Zhangye, including Zhangye station and Zhangye west station(high-speed rail station). You can take railway from different directions like Lanzhou, Xi’an, Dunhuang, Jiayuguan and Xining to head for Zhangye. QUESTION 3: HOW TO GO TO ZHANGYE DANXIA GEOPARK ? 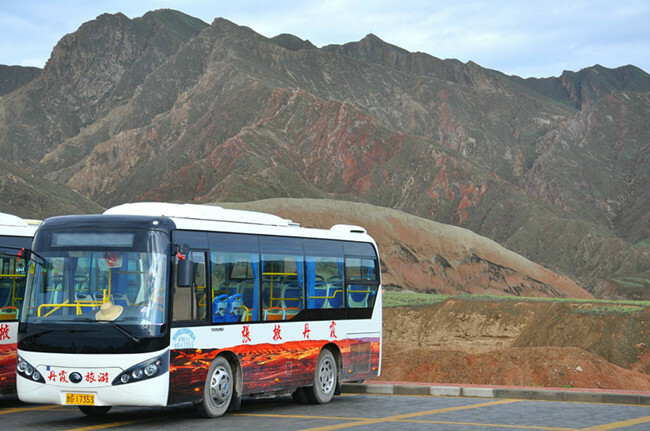 Since now, the express coach between Zhangye West Bus Station and the scenic area has opened and the ticket price for one way is 10 yuan per person, for a round trip is 20 yuan per person. The entire drive takes about 50 minutes and the departure times are fixed respectively at 07:30, 08:00, 08:40, 09:20, 10:00, 12:00, 13:30, 14:30, 15:00 and 17:00. 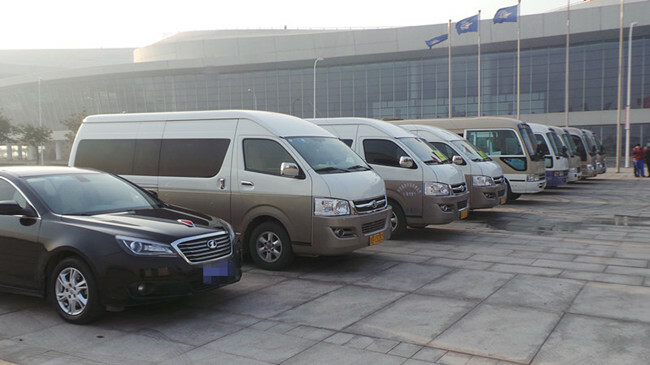 Upon arrival in Zhangye, you can take a taxi to Zhangye West Bus Station. You can buy tickets at the station window or in the self-service machine at the west station. What needs remind is that return ticket is valid till 6 p.m. at the latest or will be forfeited. Disadvantage: 1. Departure time will make you miss the best time to watch sunrise and sunset in the scenic spot. 2. A large number of people, being crowded. 3. Language barrier, it is possible to occur communication disorders. 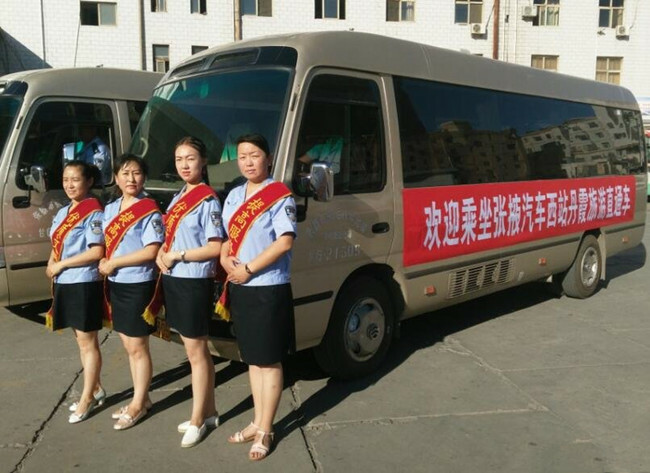 Before getting to Zhangye, the tour advisor from us will send you the driver's name, contact number, vehicle's branding & seating capacity 2 days ahead of your arrival date. If you failed in getting these information, please try to contact your travel advisor. 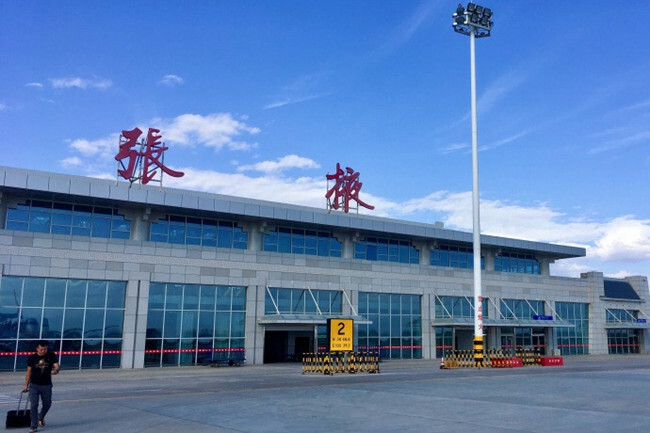 When you arrive at Zhangye airport/railway station, our driver will receive you at the exit of luggage claim hall holding a sign with the lead passenger's name. If there is any difficulty in locating the driver (this has never happened before), just call our 24/7 emergency line shown in our confirmation letter and ask for help. Our driver can show you to the nearest toilet and money exchanger if you need. At the hotel, your driver will help you with luggage handling and check in procedure. Pick up from airport: We provide up to 2 hours of waiting time at the airport after your flight arrives, counting from the actual landing time. Otherwise, additional waiting time fees may apply (USD5 PER half hour). Pick up from hotel: We provide up to 20 mins of waiting time at your designated pick-up address. If you don't show up during the waiting time and cannot be contacted, you will miss your car and receive no refund. If you need car rental service in Zhangye, now please don’t hesitate to contact us for the optimal offer and best service! QUESTION 4: HOW ABOUT THE TRASFFIC IN SCENIC SPOTS ? Zhangye Danxia Geopark has a large area, so walking is not recommended. There are sightseeing bus (20 yuan per person) in the scenic spot for tourists to and from each viewing platform, you can order this while buying the tickets.